A year has passed since Jazeta saved Princess Lily and the world of Neutopia from the evil demon Dirth, and everyone was living in peace until monsters appeared once again as more labyrinths have suddenly appeared. When there was a rumor that the evil demon Dirth has reappeared again, Jazeta went to investigate, but he hasn't returned since then. But now it is up to Jazeta's son to find his father and possibly save the world from an unknown evil threat. The controls are pretty much the same as the first game, you have the attack button and the "use item" button as well as the inventory button, however one major improvement in this game is that you can actually move in 8 directions rather than 4 in the first game, it feels really comfortable and makes the gameplay feel much more smooth, and one amazing improvement that this game has is the hit detection, in the first game, the hit detection was annoying in terms of its perspective since it was flawed (for example you can get hit if someone touches your head, regardless if it was in front of you or not, and said range is not in your attacking range for your sword) and made the game much more unfairly difficult, but in this game, while its perspective is somewhat fixed in this one since you can't get touched by the head by enemies but there are some traps that do, the hit detection in this game has been highly improved now that the enemies can't hurt you if they touch your head, and thanks to the 8-direction movement, you can also attack in 8 directions with your sword as well, giving you the advantage to defend yourself to be much more effective than in the first game. Speaking of items, all of the usable items and key items from the first game are here as well, such as the bombs, lantern and the rainbow drop that act just like the bombs, the candle and the ladder respectively from the first zelda game, there are also new items such as more magic rods aside from the fire rod that’s also in the game that can each be found in secret areas throughout the whole world such as the wind rod and the lightning rod, and each of them have a different attack pattern that differentiates from one to the other as well as how they change depending how much health you have or how bigger it is, they act just like a range weapon like in the first game, but the thing is that the rods have been modified to be much more weaker than your sword attack, making them be much more convenient rather than necessary unlike the first game, and there's also a boomerang as well, but you need to be careful when you throw it and then quickly move to the next area since it will be lost and you have to buy another one, it's not a glitch however as the game also tells you about this weakness. And new key items such as an item that can make you enter the underwater territory and an item that doesn't make you slip on the ice, and the items that enemy drop are back as well and this time as a little more frequent than in the first game, making things such as collecting gold and even collect health items (although it's not too frequent since there are some enemies that can give you health items and others don't) much more quicker than in the first game, there’s also a new item that the enemy can drop sometimes that can kill all the enemies on the screen with some sort of crystal power, and lastly the equipment upgrades such as the sword, shield and armor are also back in this game, where they are hidden in each dungeon and each of them can improve their effectiveness (such as the attack power in the sword, the damage resistance of the armor and the area of protection from ranged weapons of the shield) if you collect them, these new items are a very welcome addition to this game, making it much more bigger with more variety than in the first game, and some items have been changed as well, such as the compass in the inventory screen from the first game that only works inside the dungeons and not on the territories (which is understandable since the territories aren't very exploration-friendly) and you don't need a separate item to get the password when saving. As for the dungeons, while the territories can be a little bit more complex in order to find the dungeons the further you go into the game, the dungeons however can get more effectively harder than the territories, first off the dungeons have much more new designed rooms such as walls that give the room a unique design instead of using blocks in a big open area in the first game and most of the details of the first game such as the pools and the stones as well as the traps (like the trap blocks that can hurt you if you get closer to them and the enemy pits that respawns enemies constantly) are also back in this game, as well as introducing new ones such as trap floors that, when stepping on it, can either push down a stone that can open a new way in the room or make some holes in the walls throw spears at you (which are very easy to avoid due to how slow they are...), and lastly the dungeons, when going more further into the game, now have floors that you can climb up or down with stairs and also some instances where there’s a giant room that needs 4 screens in order to be fully explored, making them be much more longer to beat, similar details from the first game such as the key to open the boss' room and the crystal ball that can reveal the whole map that both are also hidden in the dungeon are also in this game, as well as pushing blocks and defeating all enemies to open the doors to the other rooms. Each dungeon has been designed in order to explore them as you find the upgradable item and reach the boss of the dungeon so that you can defeat it and receive the item you must need in order to progress through the game, there's even the secret rooms or hallways from the first game that you can bomb the wall in order to reach them to either reach the item you want (as well as others that can help you such as bombs and medicine) or just make yourself a shortcut, so in other words, the dungeons heavily encourages exploration more that the territories of the whole world. 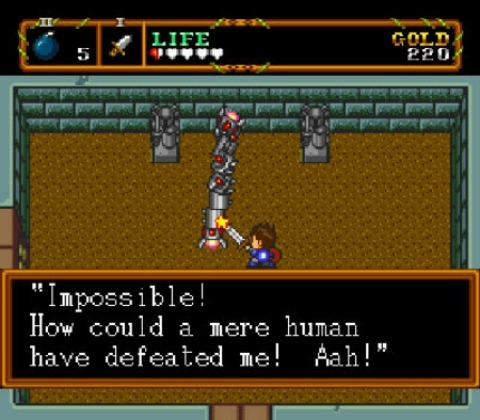 The difficulty in this game has been much more balanced compared from the first game, while it is somewhat easier in the beginning, it gets much more harder later on in the game, while it can be disappointing for those who wanted more exploration in the territories while looking for the dungeons, the territories and definitely the dungeons can get much more harder with enemies that are strong and can defeat you if you're not careful while having a complex dungeon also filled with harder enemies, but while on the other hand, thanks to the improved mechanics and controls, it shouldn't be that difficult or bothersome in order to defeat the enemies, and not to mention the items that they can drop are much more frequent, getting much more gold and bombs and other helpful items more quickly, as well as some helpful usable items like the new magic rods, and this also means that you will rarely have that problem where you will be defeated quickly and then you will be transported to the last place you've saved so that it can remove half of the amount of gold you have (obviously it will be a problem in the last few dungeons due to how difficult they can be) ! so I can say that this game feels much more balanced in terms of difficulty unlike the first game. The gameplay is great, it made a lot of improvements as well as introducing much more content from the first game, the new way of moving the character as well as its somewhat fixed hit detection makes this game much more appealing, even though some of the exploration from the whole world can be somewhat linear, the dungeons really make up for it due to how long and complex they can be later on in the game, some people might enjoy it, but I feels that others who really love exploration in their games might not like it as much. This game, compared to the first game, is also colorful and full of variety, only this time it is a bit more detailed in terms of the design in the environments, but it does include more variety such as the villagers mentioned before as they have different looking ones in each territory, as well as having more designs aspects inside the houses such as more furniture and shops that shows you some of the inventory and furniture too, the dungeons while not changing much, they still change their color pattern to represent the tone of their territory's environment that are located in, the character models however have been simplified, as they look more cartoony and bigger than in the first game, and the enemies have a little much more detail on them while also looking cartoony, but overall the game looks just as great as the first game, only this time with a bit of an improvement on the details as well as having much more variety that makes it a little better. The soundtrack is pretty good, each territory has its own song and each of them is pretty catchy to hear although they have a different tone, specially the dungeon song since it somewhat sounds like an 1980s song without the vocals... however some of the songs from the first game have been downgraded such as the one picking up an item from a chest sounds really dull and when opening a door to a room in the dungeon has been simplified and there isn't any song when discovering a secret entrance in the main territories, but other than that, it is a somewhat nice improvement from the first game. The sounds are nice to hear as well, some of the sounds from the first game such as picking up gold, attacking, etc. have been changed to become a little more quiet as the songs are much more louder, but they do sound appropriate for this game still, specially the sound that makes when you are low on health since in the first game it was very distracting and bothersome while in this game it has a different sound and it's very quiet to the point in which you need to hear very closely to hear it, removing all the distraction that it had before which is a good improvement. 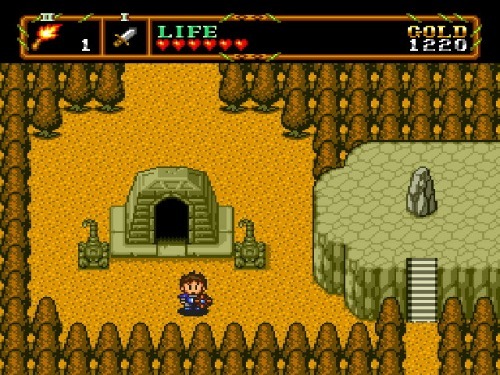 If you loved the concept of the four overworlds from the first game as it gave a unique feel to its environment, you might be disappointed with this one, since the whole game takes place in one single overworld, but each part of the overworld has its own separate environment, such as a desert territory, a snow territory, a forest territory, etc. and I do feel that each of them have a unique environment that sets apart from itself from others, and not to mention that when you are about to leave a territory to go to the next one, there might be some instances where you will have a path that will hint you what kind of area you will enter next (for example, when leaving a forest territory to go to the snow one, the forest changes so that it has a little bit of snow on the pine trees and the grass is in a pale color), while these moment are not frequent, they do make the game special in terms of what the overworld is offering to us in its environments. The whole design in this game is great in a minimalistic way. as it's overworld is not as big as the first game, it does have some great designs that makes it look great even though it looks small, specially the villages as they are very small but they look great and a very welcoming addition to this game in a sort of cute kind of way. One thing I would like to mention however is how the HUD is presented in this game, since the bomb counter has been removed from the first game, instead it’s just the gold counter and the health meter as the amount of usable items are this time shown in the "usable item" button icon, while it works great for items such as bombs to count how many do you have, it also shows you the amount of all usable items you have as well strangely enough, like for example, when you equip any item like the fire rod, you can see there's a 1 next to it, giving you the impression that you can acquire more of this said item (look at the picture below to see what I'm talking about), but the thing is that this is just an unnecessary detail that was not removed or modified in the game, maybe due to the programmers of this game not knowing how to remove it or something like that, it’s a little bothersome at first, but you might get used to it once you get further into the game. As for the replayability... there isn't much to do in this game aside from acquiring some items or powerups that you might have missed or some of the secrets that you might not have found in the dungeon's walls, but most of these might have been done before if you really needed the upgrades in order to face the harder dungeons, but as for the missed hidden secrets in the dungeons, you can get some amount time spent looking for them. Awesome review dude, keep up the hard work. I'm surprised Nintendo didn't sue Hudson for the obvious similarities the The Legend of Zelda series, but I do like the game and your review is great. 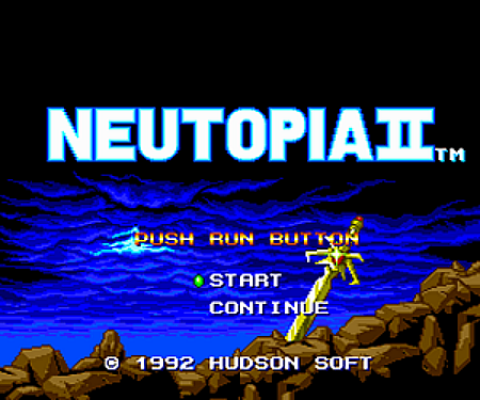 How similar is Neutopia II to The Legend of Zelda: A Link To The Past? In terms of game play the games are almost identical, but the story's are different and the graphical style is also different. Why did Nintendo not sue Hudson for infringing on their copyrights? This is the best Zelda game Nintendidn't make! 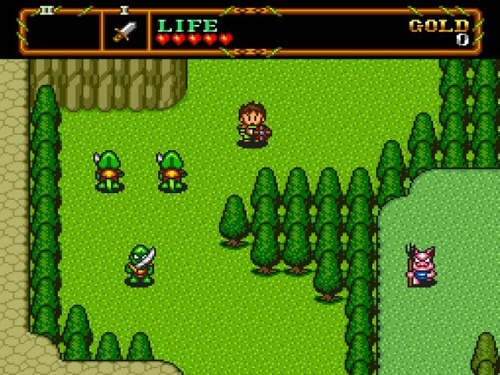 @Talesfanatic wrote: This is the best Zelda game Nintendidn't make!